Discover the best leather seat covers for your car, SUV and truck. What are the best leather seat covers on the market? Let’s investigate our options. 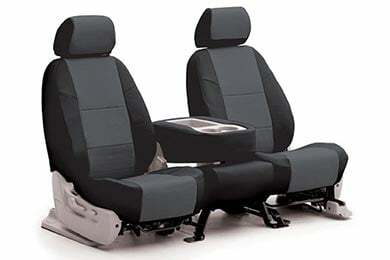 Your driving throne is covered in grand style with CalTrend Genuine Seat Covers. These stately covers feature top-grade leather on the seating surface and durable leatherette on the sides. Made to order, each set of Coverking leather seat covers are easy to install and available for most first, second and third row seats. Leather is easy to clean and available in black, beige, grey and taupe giving your mobile castle a beautiful feel and style mile after mile. Who ever said living like royalty has to be pricey? If you want the look and feel of leather without the high price, look no further than Coverking Leatherette Seat Covers. 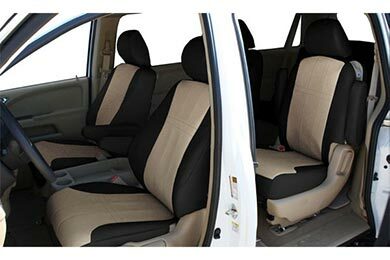 Coverking seat covers are made to order to ensure a perfect fit. The high-grade vinyl fabric guards against UV damage, stains, mildew and rot, and with a tight fit, these covers resist seam slippage time after time. Leatherette seat covers are available in solid or two-tone colors: black, charcoal, gray, beige, red/black, yellow/black, beige/black, and charcoal/black. Another option for faux leather seating is the buttery goodness of CalTrend’s I Can’t Believe It’s Not Leather seat covers. A less expensive, animal-free alternative to authentic leather, CalTrend’s I Can’t Believe It’s Not Leather material covers your seats in style. These covers may be faux leather, but the reinforced seams and UV-treated fabric deliver authentic durability and finesse to your vehicle’s interior. Whether you’re searching for high-grade leather Toyota Tacoma seat covers or less expensive leatherette Ford F150 seat covers, there are options to match the taste of the most discerning drivers. Also, be sure to check out the leather seat covers reviews on our site. Looks like a million bucks! Love these seat covers and would recommend to anyone looking for a change or to save their seats! Front seat covers were very easy to install. The back seat covers were not as easy. I decided to take the back seats out to install the seat covers. The total time to install was 3 hours. I installed them by myself, so it’ll be quicker if you have help. Seats look and feel great. I am impressed. Reference # 761-759-540 © 2000-2019 AutoAnything, Inc.